For individuals under bariatric care who are frequently bed-bound, there is an increased risk of developing pressure ulcers. This can be incredibly uncomfortable and painful, and can even lead to the development of infections. 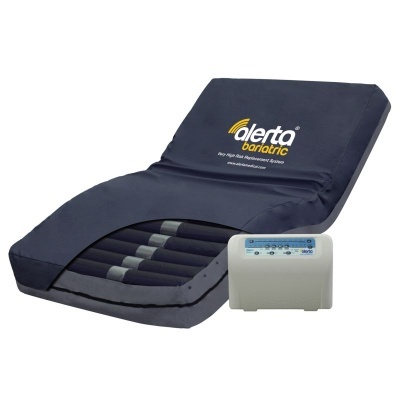 The Alerta Bariatric Alternating Pressure Relief Mattress is a pressure relief mattress designed specifically for individuals undergoing bariatric care. Ideal for hospital, nursing and care home environments, it actively works to prevent pressure ulcers in individuals at a very high risk of developing them. To help prevent pressure ulcers developing, the Alerta Bariatric mattress utilises a triple cell-on-cell air cell design. This more evenly distributes pressure and helps to constantly shift pressure across the body for improved pressure relief. The cells are made from nylon and are TPU coated for better fluid control. Alongside the cell-on-cell design, the mattress utilises revolutionary SensaCare Truflo technology. Using an air pressure sensor, the mattress automatically detects pressure on it and regulates inflation to provide ultra-low interface pressure. This promotes natural sleep patterns and helps ensure stable blood circulation. As well as providing effective pressure relief for the patient, the mattress is also incredibly easy to use for the clinician or carer. A clear, easy to operate control panel enables you to easily set and adjust the functions of the Alerta Bariatric mattress, including adjusting seat inflation, cycle time and weight. The control panel can even be locked to prevent accidental or deliberate tampering. An integral alarm will audibly and visually sound should power be lost, helping you provide the correct care no matter the situation. The incredibly quiet function of the mattress – provided by the Ultra-Silent pump operation – enables patients and residents to comfortably and easily sleep on the mattress without being disturbed. To help protect the mattress from moisture and damage, a PU cover is included. Its multi-stretch design helps protect it from tears and damage, and also makes it easy to put on and take off. The cover is also waterproof and vapour-permeable, preventing the mattress from condensation and fluids. Machine washable and antimicrobial, the cover makes hygiene maintenance easy and simple.